We propose a novel cross-sectional structural analysis technique that efficiently detects critical stress inside a 3D object. We slice the object into cross-sections and compute stress based on bending momentum equilibrium. Unlike traditional approaches based on finite element methods, our method does not require a volumetric mesh or solution of linear systems, enabling interactive analysis speed. Based on the stress analysis, the orientation of an object is optimized to increase mechanical strength when manufactured with 3D printing. 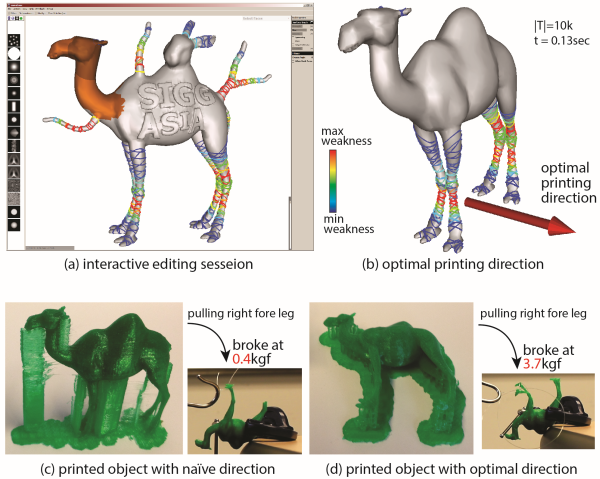 Nobuyuki Umetani, Ryan Schmidt, "Cross-sectional Structual Analysis for 3D Printing Optimization", SIGGRAPH Asia 2013 Technical Brief. We are grateful to the authors of [Stava et al. 2012] for sharing their 3D models.